Fun Home 2015 Tony winner: How did a graphic novel become a musical? Fun Home Won Five Tonys. How Did a Graphic Memoir Become a Musical? 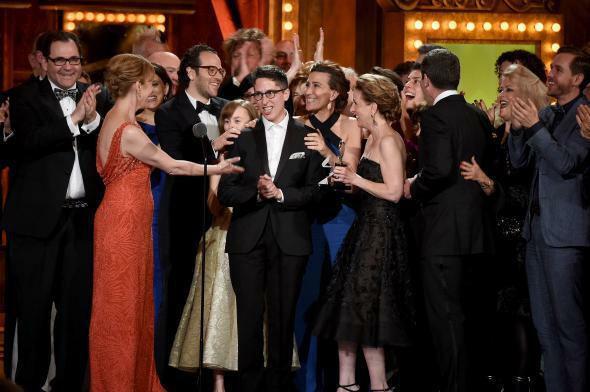 Alison Bechdel (center) with producers and members of the cast and creative team of Fun Home celebrating the Best Musical win at the 2015 Tony Awards. Fun Home, the musical based on Alison Bechdel’s graphic memoir, was the big winner at the 69th Annual Tony Awards on Sunday, taking home five awards. The show won Best Musical, Michael Cerveris was Best Leading Actor in a Musical, Sam Gold won for Best Direction of a Musical, Lisa Kron took the Best Book crown, and Kron and Jeanine Tesori took Best Original Score, making them the first female writing team to win in that category. In October 2013, just before the show opened off-Broadway at the Public Theater, June Thomas spoke with Bechdel, Kron, and Tesori about the process of adapting the memoir for the stage. Is America ready for a musical about a middle-aged, butch lesbian? That’s the question on the minds of Lisa Kron and Jeanine Tesori as they prepare their version of Fun Home for its Oct. 22 premiere at New York’s Public Theater. Based on Alison Bechdel’s graphic memoir, Fun Home tells the story of Alison’s coming out to her parents, and of her father Bruce’s suicide a few months later. “Nothing takes you inside the soul of a human being like a musical does,” Kron, who wrote the show’s book and lyrics, told me a few days before previews began on Sept. 30. “Are people willing to go there with people who are always on the outskirts, particularly of this form?” After five years’ work on their adaptation, she and composer Tesori certainly hope so. Shows like Billy Elliot have portrayed the inner lives of gay boys, but Fun Home is the first mainstream musical about a young lesbian. “Musicals are traditionally the straightest of the straight, even though they were largely made by gay men. They’re about a leading man and an ingénue,” says Kron. Fun Home, on the other hand, examines a father-daughter relationship, with Alison as the main protagonist. Kron and Tesori’s solution was to cast three Alisons—in the Public Theater production, 8-year-old Alison will be played by Sydney Lucas, 19-year-old Alison by Alexandra Socha, and 45-year-old Alison by Beth Malone. This allows the show to depict the father-daughter relationship at three key stages in Alison’s life: when Bruce was clearly in control; when she came out and the balance of power started to shift; and when she’s at the approximate age as her father was when he died, and she has made peace with him. Can one new musical overcome years of lazy stereotyping? In the Fun Home preview that I recently attended, no one giggled when young Alison sang “Ring of Keys.” Instead, the song elicited gasps of recognition. *Update, Oct. 9, 2013: Slate learned the official song titles after publication, and two of these titles have been adjusted accordingly.